The R2-D2 Interactive Astromech Droid is one of Creature Labs' odder productions. 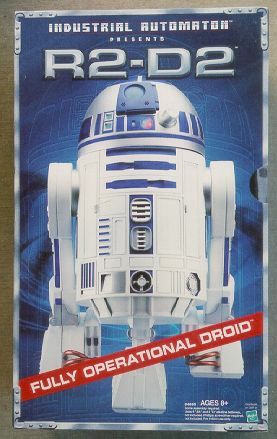 Released in September 2002 by Hasbro, this 15 1/2" droid is almost half the original size of the droid in the Star Wars movies. The droid is not a cheap knockoff - it uses sonar to detect obstacles and has proper tracked movement; it also responds to set voice commands to move around and patrol areas, and while it does not share the AI of games in the Creatures series, it can play a number of games (e.g. "laser tag", "room guard", "spin the droid"). It was designed (on the CL side) by Dr Dave Keating and Charles Garcia Tobin. The toy received pretty good reviews and has been popular with buyers. The line has been reissued a number of times, and is still available at some retail outlets. SteerPike has also made an R2-D2 COB. This page was last modified on 4 November 2016, at 21:10.